How should the global positioning of Army forces and assets be determined in the light of ongoing and potential changes in the national security environment? What is the framework for determining a responsive and effective Army global posture? How should political reliability be integrated into basing choices? Is there a model for determining basing locations for U.S. global posture? Is there a need for basing forces forward for security cooperation? What can be done to improve future Army responsiveness and effectiveness? The U.S. global defense posture — the size, location, types, and capabilities of the U.S. forward-based military forces — is an integral and critical component of the U.S. security strategy, allowing the U.S. military to respond quickly and effectively to threats and contingencies. Forward deployed Army forces and the military infrastructure associated with them play an important role in the ability of Army forces to project power, deter adversaries, and engage with partner forces. As the security environment continues to evolve, the United States needs to assess continuously the applicability of its global defense posture to the emerging needs. This report develops a methodology and a framework for global Army positioning in the context of the global defense posture of the United States. The key element of the framework is the interplay of missions assigned to Army forces, types of bases, and base locations. The report uses the framework to assess U.S. Army forward stationing from a perspective of maximum responsiveness and effectiveness in addressing potential crises and increased security cooperation. The report identifies locations in several states in which either increased or new Army presence may be useful in advancing national security goals. Further action depends on determination of a need for greater robustness, faster responsiveness, or deepening a critical security and defense relationship in a given region. The framework presented in this report could be used by combatant commands for assessing optimal forward presence. The methodology has the potential to be developed further as a decision support tool for DoD's future posture decisions. A planning and decision support tool for future Army forward basing choices needs to include an assessment of the political reliability of the host state to ensure unconstrained use of the base. Several specific locations emerged consistently from our analysis as improving responsiveness. Minimal adjustments by upgrading these locations may have substantial impact for robustness of forward presense and ability to respond to crises. Choices regarding new bases depend on assessment of trade-offs between the costs associated with upgrading the facilities at proposed locations and the marginal benefits in responsiveness. Given the limited gains in responsiveness, robustness and strengthening defense relationships provide more valid justifications for the infrastructure improvements that might be needed. Assessing the utility of forward basing locations for purposes of steady-state security cooperation does not offer clear results akin to those for assessing responsiveness; depending on the scope and size of the effort, it is not a given that basing forces in country — other than rotating training teams — is necessary for the effectiveness of security cooperation. Changes to Army global positioning depend on the determination that greater robustness, faster responsiveness, or deepening a critical security and defense relationship is needed in a given region. The Army should conduct detailed cost estimates for the infrastructure improvements needed in the states found most appropriate for increased Army presence. An assessment is necessary of the demand for security force assistance and partner capacity-building activities and considering basing choices as part of the solution set. It could be useful to experiment with different ways to build partner capacity, in terms of basing arrangements, within a geographical combatant command to better understand the costs and benefits of alternatives. Combatant commands and service component commands can use the framework developed here for planning purposes and assessing trade-offs in forward basing decisions. The methodology has the potential to be developed further as a decision support tool for DoD's future posture decisions. This research was sponsored by the Army Quadrennial Defense Review (QDR) Office in the Office of the Deputy Chief of Staff, G-8, Headquarters, Department of the Army, and was conducted within the Strategy and Resources Program within the RAND Arroyo Center. 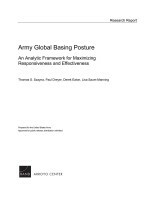 Szayna, Thomas S., Paul Dreyer, Derek Eaton, and Lisa Saum-Manning, Army Global Basing Posture: An Analytic Framework for Maximizing Responsiveness and Effectiveness. Santa Monica, CA: RAND Corporation, 2015. https://www.rand.org/pubs/research_reports/RR158.html.